After having a successful 2018, young sensation Vijay Devarakonda is hoping to continue his form this year as well. At first, his film Dear Comrade will get released from the lineup. Directed by debutant Bharat Kamma, this movie is slated to get released on May 31st in all South Indian languages. These days, our producers are playing a safe game and having solo releases to avoid any competition. Even Dear Comrade has opted the same route. 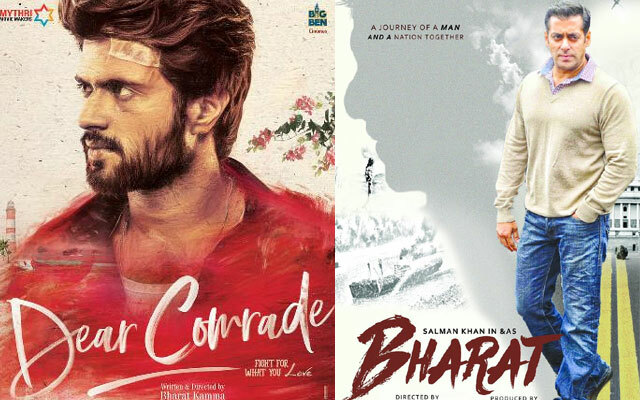 But it has a threat in the form of Salman Khan's Bharat, which will release on June 5th. Dear Comrade is releasing a week before, it is an advantage for it and it will be in a safe zone if gets a blockbuster talk. But if it secures any lesser talk than that, the film will be affected in all the metro cities with Bharat. There are a lot of expectations on Bharat as well as it is coming after Salman's last debacle, Race 3. Anyways, we can only know both the films' fate only when they hit the screens. Baahubali Writer Fears Fan Protest!